To provide the best possible behavior modification strategy and training plan, you will need to fully complete a canine Behavior History (BH) form, including information regarding any current medical conditions for the dog with the unwanted behaviors, as well as provide proof of vaccinations or sufficient titers, for each dog in the household. Please complete your BH form thoroughly and return it, along with proof of vaccinations, so they are received by 8AM, seven days before your scheduled appointment. You may email them to Colleen (see Contact Us page) or if you’d like to mail them by post office, inform Colleen and she’ll send you a mailing address. Please provide a brief video of your dog’s home environment, such as your backyard and the inside of your house if your consultation will take place away from your home. I would also like a video of your dog displaying the behavior of concern, but only if it is SAFE to do so. Please do not attempt to capture any aggressive behavior(s) which will pose potential risk/harm to your pet, anyone else, or any other animals. If you suspect that your dog suffers from separation anxiety, it’ll be important to video your dog starting a few minutes before you leave and continuing at least 10 minutes thereafter (understanding this condition requires insight into the pet’s behavior when left alone). For any other behavior issue, please limit your video to about 5 minutes. Please read through the Behavior Modification Consultation Frequently Asked Questions document for more information regarding videoing your pet. Visual content helps enable me to characterize the motivation for the behavior and develop an appropriate training plan. While you are encouraged to email the video to Colleen ahead of time, you may also bring the video with you to the appointment. Smart phones, webcams, video cameras can all be used for the video. You may also use YouTube to post your video privately and inform Colleen of the login (or you can post as unlisted and send a link to Colleen), so your video can be reviewed prior to the appointment. Please limit your dog’s food intake within 6 hours of your scheduled appointment, unless your pet has a medical need to eat regularly. I may use food as a tool to train your pet during your appointment, and I want him/her to be as willing as possible to work with me. If your dog has a specialized diet (for example, food allergies), or is a picky eater, please bring a portion of a favorite treat or high value food for me to use. Examples of high value foods include chicken breast, beef, ham, or cheese that you purchase in the meat or dairy section of the grocery store (i.e., human food). It’s best to not use lunchmeat or cheese slices since the thin nature of the slices makes it difficult to handle. Submit your deposit (50% of the consultation fee + plus any pertinent travel fees) for your consultation. You can use the PayPal button on the Behavior Modification Consultation page (click here for PayPal button) to submit payment. Or, if you'd like to send a check via the US Post Office, inform Colleen and she'll send you a mailing address. The remainder of the session fee is due at the time of the appointment. You may pay for the entire session fee up front if you like. Click here to find the BM Session rates. Complete, sign and submit the Training Agreement (click here to download the Training Agreement Form). You may email, fax, or mail the form (ask Colleen for her fax or mailing address if you prefer either of those options). Once your deposit and signed Training Agreement are received, your appointment date and time will be finalized and held for you. You may want to agree on a tentative date prior to sending your deposit and signed Training Agreement, but appointments will not be held for more than a few days without receiving BOTH the deposit and the signed training agreement. Email, fax, or mail the completed Behavior History form, and proof of vaccinations a minimum of 7 days before your appointment (sooner is better if possible). Let Colleen know if you need a fax number or mailing address. Your appointment day & time will be forfeit (and given to another client) if Colleen does not receive these documents a minimum of 7 days before your appointment. Read through the Behavior Modification Consultation Frequently Asked Questions (FAQs) page and follow the directions for the appointment requirements, including the equipment you need to have on your dog and any additional information she may send via email in preparation for her visit (if she will be conducting the consult in your home). Video your dog's unwanted behavior(s), if safe to do so, and email or post the video(s) before the appointment. If you will be traveling to HTDT's facility for your appointment, video a representation of your dog's entire home environment and bring the video with you to the appointment. See the BM Consultation FAQs page for video tips. Note: to receive a $10 discount on your initial appointment, you must submit the completed behavior history form and signed agreement no later than 7 days prior to scheduled appointment, as well as provide the requested video. 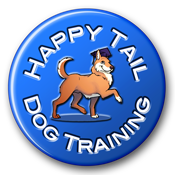 © 2012 - 2017 Happy Tail Dog Training LLC. All Rights Reserved. Materials not to be copied, distributed or used without prior written consent.